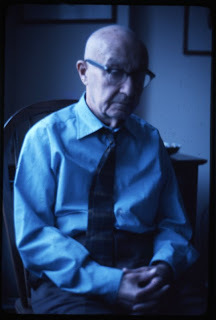 Newly released reading of Rezi's "Holocaust"
Abraham Ravett took this photo of Charles Reznikoff in Rezi's NYC apartment in December 1975.Abraham Ravett took this photo of Charles Reznikoff in Rezi's NYC apartment in December 1975. Ravett was making his diary-film Thirty Years Later (completed in 1978). He included in it film he made of Reznikoff reading from his long poem Holocaust and we at PennSound have now extracted the audio of the reading from the film. Go here to a special PennSound page and find the audio segmented and some notes by Ravett.